The Charlotte Bobcats fell to the Dallas Mavericks at the Cable Box 89-84, falling to 0-12 versus Dirk and Co. all time. AP recap here, box score here. After fleetingly moving up into the 8th spot when Miami lost back-to-back games over the weekend, the Cats have fallen back to 9th place in the East at 28-30 overall. The Cats came out strong in this one, building an early 20-9 lead midway through the first quarter. Another spurt to end the second had the Cats up 53-43 at the half. Tyrus Thomas had a great first half, keeping Dirk quiet on the defensive end and pacing the Cats with 12 points. But the second half was a different story, as the Cats could only muster 31 points the rest of the way and were overtaken midway through the fourth quarter. The offense looked like a hot mess. Here’s what you need to know: The Cats had more turnovers (11) in the second half than field goals (9). Tyrus Thomas led the Cats with 16 FGA. Gerald Wallace had just 8, with only 1 (a 20 foot jumper) in the deciding fourth quarter. Stephen Jackson finished with 20 points on 6-14 FG, but spent more time fussing at referees and turning the ball over (6 times) than scoring. There were three airballs in the fourth quarter, plus a monumental brick by Boris on a three attempt. Meanwhile, despite decent defensive efforts from Boris Diaw and Tyrus Thomas, Dirk Nowitzki heated up and finished with 27 on 12-23 FG to put the Cats away. Caron Butler went for 22 on 10-16 FG, while Jason Terry contributed 20 on 8-17 FG off the bench. The Mavericks are now the hottest team in the league with 8 wins in a row. Why did the Cats fade so badly after a solid first half? You could argue that the Cats don’t have a go-to guy like Dirk, who can get buckets and draw double-teams. You’d be partially right, but in Stephen Jackson we have the closest thing we’ve ever had to that guy, and he’s been pretty good this season. You could argue that the pressure of facing the elite Mavericks, knowing that they were winless against them all-time, got to the Cats and caused some tightness. I couldn’t prove you wrong. It’s certainly happened before. We’ve been worried about it all season. 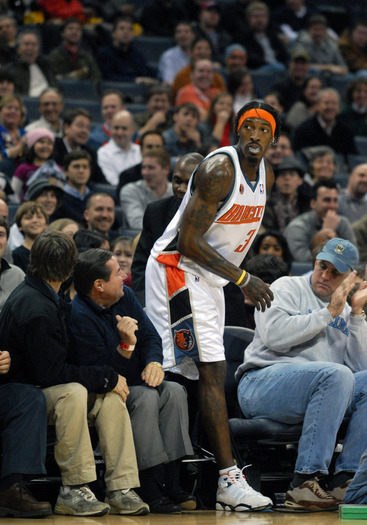 Gerald Wallace leads the league at 42.4 minutes per game, while Stephen Jackson is sixth at 39.5. 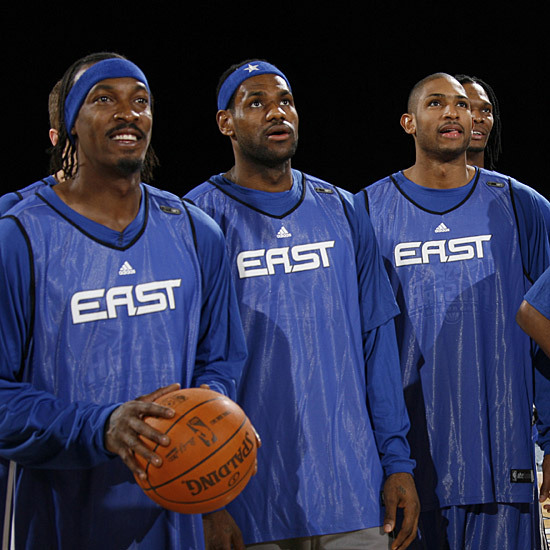 Now look at the the rest of the guys at the top of that list (Monta Ellis, Rudy Gay, Kevin Durant, etc.) — all younger. Crash and Jack have too many miles on them to be playing 40+ minutes a game regularly, and I fear that we’re starting to see all that court time take a toll. Glad that Jordan finally bought the team, hope it leads to him being around and engaged more often, but I could care less whether he plays HORSE with Gerald Henderson at shootaround or gladhands local politicians. Wake me when he does some real homework and makes a good first round draft selection, or shows some understanding of the salary cap. No Nazr (back spasms), Chandler (foot/ankle) or Diop (knee) tonight. Really could use Nazr back playing 15-20 mins, then Theo playing 10. Might allow Gerald to get a couple more minutes of rest. So the Cats won’t be signing Larry Hughes or Mike James, but what about Michael Finley? Sounds like he’s headed for the Celtics or Lakers, and not sure how much he brings to the table anymore, but you’d hope that Jordan/Higgins at least make a call. Is Finley still a Brand Jordan guy? Next game is Wednesday night in Boston — sounds like Pierce will be back in the lineup. Despite injuring his ankle a day earlier in practice Raymond Felton was determined to play Tuesday night. The Washintgon Wizards probably wish he’d stayed on the sidelines in a suit. With just seconds left on the clock and the teams tied at 92-92, Felton handled the ball, drove left and stepped-back for a jumper contested by Wizards guard Randy Foye. With the release of his shot, Raymond made sweet love to pressure – in front of the 7,000 or so fans at the arena, Michael Jordan, Alexis Ajinca, Stephen Jackson, and the rest of his teammates. The shot had put the Bobcats up 94-92, giving Felton’s agent a video clip to play on repeated loop while negotiating his deal with Charlotte this coming off-season. Washington was left with 1.9 seconds and a failed scoop shot attempt from Antawn Jamison before the buzzer sounded, their loss was official, and Rufus celebrated on the court for the last home game before the All-Star break. Considering their recent woes, it was surprising that the Wizards showed some fight in this game. Both teams took turns making runs and neither club looked to control the game for more than a minute at any point in the contest. Washington’s big men are surprisingly good. Jamison (16pts), Haywood (12pts), and Blatche (15pts) can all hit from the inside and work their way in the paint. Those skills proved to be a bit of a problem for Nazr Mohammed and Boris Diaw early in the game. Over the last couple of weeks, most Cats fans have become exhausted by watching Diaw pass up good shot attempts to find his teammates for lesser opportunities. This game showed the kind of performance Diaw should aim for on a consistent basis. Boris was able to knock down outside shots to help spread the floor for Charlotte, and he made smart moves without the ball for easy buckets around the rim. It should be noted that he even threw down a two-handed jam at one point! Going into the game, the Bobcats made the decision to activate Tyson Chandler after the foot injury that had shelved him since late December. While Tyson wasn’t the difference maker in this one, he showed that he can contribute to the squad. Some of his mistakes were more mental than physical, improperly switching on the Wizards high pick-and-roll to leave DJ or Flip guarding a big man in the paint. With the addition of Stephen Jackson, this team has found a better flow on offense and Chandler may have an easier time of finding his place in their pecking order as he returns to action at this stage of the season. During the second quarter, it was nice to see DJ work to find looks for Chandler. One one possession, Augustin slid past two defenders into the paint and had an open look at the rim. He chose to lob a pass for a Tyson throw-down rather his own score. The crowd definitely appreciated those two points a bit more than a DJ layup. Raymond Felton surely gets the player of the game for his toughness to suit up and hitting a mega-clutch shot to close the game. Gerald has become so steady that his 17pts / 13 rbs seemed expected. He never took over the game, but he did pose a threat throughout each quarter. The Bobcats had 5 players in double digit scoring, led by Stephen Jackson’s 22pts. Ronald “Flip” Murray put in a strong offensive performance (16pts), and once more proved how much the team needed points from their bench. Check out the blocky cartoon version of Crash on the Fan Face Off online video game! Also, there’s a new Gerald Wallace video about the Dunk Contest on NBA.com. About the game – the Washington Wizards seem to hate each other. Maybe the team has rid themselves of the rumored divisiveness caused by Gilbert Arenas, but the guys don’t seem to enjoy each other one bit. Like a married couple that everyone knows should be divorced, they had some great times a couple of years ago. They had some laughs in the past, but these days everyone can see that they despise each other. Each party involved would be happier going their separate ways. Caron Butler, who took over the game during the fourth, doesn’t even stand near his teammates during the breaks in the game. Only a few players even got in the huddle to listen to Coach Flip Saunders (no relation to Flip Murray). The Wizards need to bust this up and build upon the big men they have in place. Trade rumors have swirled around Jamison and Butler. From an outside perspective, it looks like this is the best time for those guys to leave. Speaking of trade rumors – ESPN and The Charlotte Observer have posted speculation of trade talks with Boston on their web sites. Supposedly, there is some type of DJ Augustin for Glen Davis deal in discussion. Additionally, the Observer’s Rick Bonnell reports that the Cats might be more inclined to deal with NY (Jordan Hill) or Chicago (Tyrus Thomas). Let us know what you think about these possible trades. 1. The Bobcats pull out a win against the Wizards tonight, 80-72, at the Cable Box. AP story here, box score here. Cats improve to 10-19, the Wiz fall to a miserable 4-22. 2. This was a matchup of the two worst teams in the East, and it was accordingly brutal to watch. How brutal was it? The two teams shot a combined 36% from the field. The Wizards never scored 20 points in any quarter. The Bobcats had a 10 point second quarter. The score at halftime was 36-36 — seriously. 3. Thankfully, the Bobcats were less brutal than the Wizards, and were able to separate themselves just enough down the stretch. With the Bobcats struggling mightily to put points up on the board, I was surprised that Larry Brown didn’t experiment with his bench in an effort to jumpstart the offense. But it seems like the time for that has passed, and Brown has tightened the rotations up. In the second half, he stuck mostly with DJ, Raymond, Carroll, Diaw and Okafor. Adam Morrison and Alexis Ajinca recorded DNP-CDs again, while Ryan Hollins and Juwan Howard only got 5 and 4 first half minutes, respectively. 4. If you’re looking for bright spots for the Bobcats, it has to be Emeka Okafor. Mek went for 29 points (10-15 FG), 18 rebounds (6 offensive), 4 assists and 3 blocks tonight. He was easily the Bobcats best option on offense tonight, again looking confident and aggressive. He went to the line an amazing 17 times, reflecting said aggression. The only downside to his game tonight was that he hit only 9 of those 17 free throw attempts. Oh, and that attempted monster jam that he came up a bit short on. That was pretty embarrassing. But anyways, have you looked at Mek’s game log for December? I was thinking that he’d been on fire since Diaw got here, but in fact he’s been playing strong all month. Does Okafor deserve to be in the conversation for backup All-Star center in the East? 5. Gerald Wallace was also able to buck the trend of poor shooting on the night; he had an efficient 16 points on 6-7 FGs to go with 8 rebounds. He also had a monster alley-oop jam late in the fourth to help the Bobcats pull away and send the crowd home happy. Love the look on his face in the pic above; like he’s sneaking onto the floor from the stands. It’s from a moment in the first half when he chased a loose ball up in the stands — he ended up all the way up by the dude in the bright orange sports coat. 6. The Wizards are bad. As their record suggests, they are like T-Wolves/Thunder-level bad. Jamison: 5-18 FG, Mike James 4-16 FG, Andray Blatche 2-10 FG. Ouch. On the other hand, Caron Butler is good (31 points on 12-21 FG). If the Wizards care to go in full-on rebuilding mode, I’d gladly take him off their hands. He’s the kind of fringe superstar that a small-market team might actually be able to build a competitive team around. 7. Merry Christmas, Bobcats fans. The Cats are off until Friday night, when they travel to New Jersey to take on the Nets and their red-hot, newly minted star, Devin Harris.